Fukuyama 'Masha' Masaharu was born in Nagasaki and had a reputation as a prankster in his youth. He got his nickname seemingly because his father has trouble with his teeth and couldn't say his name properly. He came to Tokyo straight out of high school and auditioned for the Amuse film company. But his first few were spent trying to build a career as a musician. He made his less than sparkling live debut in August of 1989 - no-one turned up. His debut single, released in 1990 didn't fare much better. But a later single from his debut album Message was used in a Victor TV commercial and he had his break. Weekly broadcasts on the famous All Night Nippon radio show made him a rare DJ/actor combination and also did wonders for his popularity. He appeared in his first TV drama in 1991, (Because There is Tomorrow) with popular actress Imai Miki. In 1993, the drama Hitotsu Yane no Shita (Under One Roof) was a smash and made a star of Fukuyama. He was chosen that summer as 'best jeanist', a bizarre title that gets a lot of publicity, and he had his first million-selling album Calling. He has since starred in several successful TV series, such as Hitotsu Yane no Shita 2 and Meguriai (Chance Encounter) with actress Tokiwa Takako, for which he has often recorded the title tune. He was sent by TV Asahi as a photographer for the 2000 Sydney Olympics. In polls of the most popular male performers, Fukuyama is perennially chosen 2nd behind SMAP member Kimura Takuya. In two separate surveys in 2006, he was chosen as the musician most people would want to perform at their wedding and as the ideal marriage partner. Fukuyama was already a well-established star by the time he landed his first movie starring role. He played a genius phsyicist in Yogisha X no Kenshin (2008), the big screen adaptation of the 2007 Fuji TV drama series Galileo (photo) in which he co-starred with actress and singer Shibasaki Koh. Fukuyama wrote, composed and produced the movie's ballad theme, "Saiai," which was sung by Koh. The hit TV series was adapted from a series of novels by Higashino Keigo, many of which were nominated for major awards, while the movie was based on the novel that finally won Higashino the Naoki Prize. During a radio show he hosted on August 9, 2009 - the 64th anniversary of the atomic bombing of Nagasaki - Fukuyama revealed publicly for the first time that he was "Hibaku nisei," the son of survivors of the atomic blast. He performed a concert in his hometown for the first time in nine years as part of a nationwide tour to commemorate his 20th year in showbiz. 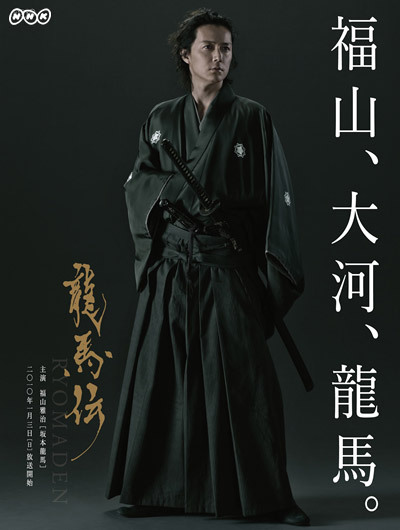 2009 also saw him filming his first ever historical drama role as the legendary 19th-century figure Sakamoto Ryoma. "Ryomaden," the taiga drama series for 2010, also saw him appearing in an NHK drama for the first time.